The Wings and DeKeyser, 26, agreed the long-term contract on the eve of salary arbitration. Detroit — Danny DeKeyser was skating on a bantam team for Compuware in the suburbs a decade ago, watching “Ken and Mickey” on TV and rooting for the Red Wings. The Wings signed DeKeyser, an undrafted free agent out of Western Michigan pursued by at least a half-dozen NHL teams, three years ago. 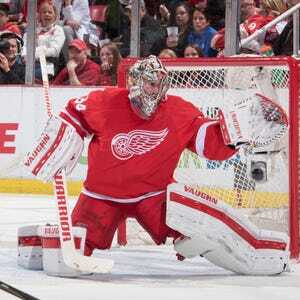 “We see him as a real good, defensive, solid D-man,” general manager Ken Holland said at the time. On Tuesday, the Red Wings made clear they believe DeKeyser, 26, is essential. The club signed him to a six-year, $30 million contract intended to secure him in a Wings uniform through 2022. In case there is much doubt, the deal affords him some control over his fate, with no-trade language in place in years two and three and, with modifications, for the last two seasons. DeKeyser, a restricted free agent, had requested arbitration, which was scheduled for Thursday. The contract might be a bit generous for a player of his skills, accomplishment and experience. But DeKeyser is arguably the best defenseman on the Wings, entering the fifth season of a rebuild on the fly in the wake of the retirement of Nicklas Lidstrom. And, even with the resignation last spring of Pavel Datsyuk, the defense is the weakest position for the Red Wings, who have won one playoff series in five seasons. “It’s a big deal for me and for my family just to be able to get some stability here and to be playing in Detroit for the next six years at least,” said DeKeyser, who intends to marry a gal from Michigan later this summer, before training camp. “My family is here. I don’t want to go anywhere else. With the signing, the Wings appear to be slightly over the $73 million salary cap for this season. Their top goalie Petr Mrazek, a restricted free agent, is scheduled for the arbitration requested by the team beginning at 9 this morning. Holland said Monday any excess total salary can be rectified before the start of the season by: sending players to Grand Rapids, deciding to buy out a player on the roster or a trade. The Wings can still make a buyout, because the collective bargaining agreement provides more time for teams facing arbitration. But Holland said a buyout is unlikely. The money and term of the contract put DeKeyser in the company of defensemen like Sami Vatanen of the Ducks ($4.88 million), Dustin Byfuglien of the Jets ($5.2 million), Alexander Edler of the Canucks ($5 million), Justin Faulk of the Hurricanes ($4.83 million) and Ryan McDonagh of the Rangers ($4.7 million). His contribution to the Red Wings is not always on par with that quintet of defenders, or some others similarly situated. But DeKeyser played 21:48 per game, 12 seconds behind Niklas Kronwall ($5.5 million) for second in time on ice among Wings defensemen. The deal also fits a decade-long trend in the NHL. Since the start of the salary cap, teams more often sign younger stars to longer deals to defer unrestricted status in free agency. That is the standing the Red Wings conferred on DeKeyser. He described his challenge and contribution. “Just improving year in and year out and just being a steady defenseman,” he said. DeKeyser scored eight goals and assisted on 20 last season, lifting his shooting percentage after two goals in the previous year, when he had 29 assists. Considerably less time on the power play had its effect, DeKeyser said. But he thinks there is some room for offensive improvement. “It’s possible,” he said. “You know, some of that comes with opportunity. “Sometimes it’s hard to pick up those extra points when you’re not playing on the power play. But, whether I’m on that or not, I’m just going to play my role five-on-five and on the penalty kill, and if I get my chance on the power play, I’m comfortable playing that as well. The understated defenseman, who grew up in Macomb and attended De La Salle High, is getting married in September, before training camp. “My fiancé is also from Michigan and it’s just a good spot to be in, with family around here,” DeKeyser said. “We’ve got family all around the state and a big date coming up for us. With the signing, the Red Wings keep five players with strong Michigan roots: DeKeyser, Justin Abdelkader, Luke Glendening, Dylan Larkin and Drew Miller. “Anybody who’s from Michigan has, I’m sure, grown up a big Red Wings fan, just like myself. And it’s been great for me to play here,” DeKeyser said. “Sometimes I kind of catch myself every now and then, not really taking things for granted but, just like not really realizing how special it is to be able to play for your hometown and your home state.